A thoughtful, rigorous approach enables our studio to design beautiful and functional environments for living, working and leisure. A home should be both a 'machine for living in' and a sanctuary. We can work closely, or independently, to achieve a design that is functional and speaks to your personal style. Our collaborative, multi-disciplinary design studio has a reputation for bringing commercial concepts to life by enriching the user experience. 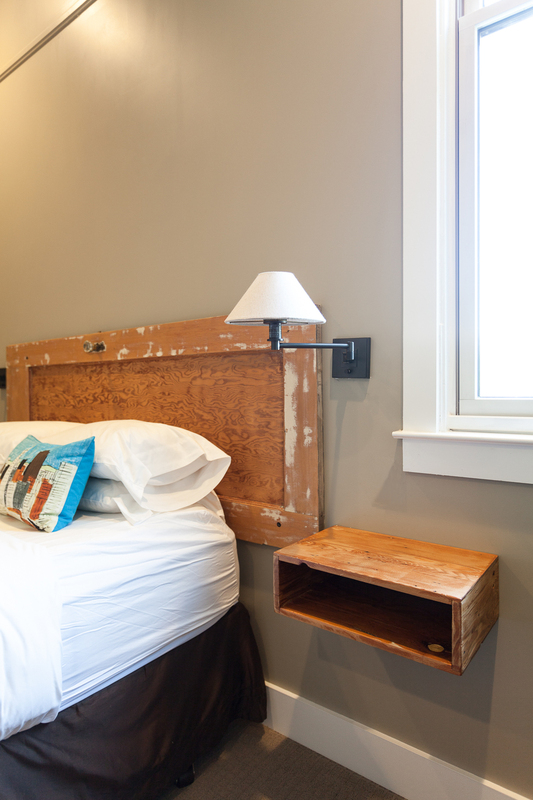 Successful boutique hotels are always high-concept. We'll work with your team from beginning to end to ensure the branding and identity inform the design. The Mill at Broadway was a clean canvas upon which we could appeal to the sensibilities of young, active urban homebuyers. Sacramento is known as the 'city of proximity', and we decided to celebrate our unique positioning by incorporating elements that inspire an adventurous, outdoor lifestyle and love of nature. Unique features include a topo map of California, a locally-sourced vintage photo of Yosemite Falls and custom wallcovering of Lake Aloha in Desolation Wilderness near Lake Tahoe. Additionally, we hope to inspire soon-to-be urban dwellers to take an approach of mixing quality, enduring furniture with affordable, and even DIY, artwork. What was once an innovative redevelopment project fell on hard times during the great recession. Our team was brought on to breathe new life into the buildings as well as design the private offices for building owners, and real estate investment firm, Sutter Capital Group (SCG). Updates to the exterior included new paint, lighting, signage and landscaping. The penthouse office interiors for SCG were also heavily informed by the building's period architecture. The logo-inspired blue and orange doors were composed using a subtle gradient effect that relate to each building's east and west location. When our interiors team was brought on, this mixed-use, affordable housing project was already deep into construction phase. The developers requested that we 'pick up where the architectural design left off', primarily with interior and exterior finishes and lighting. The project scope consisted of a notable brick warehouse juxtaposed with new, modern lofts designed with artists in mind. 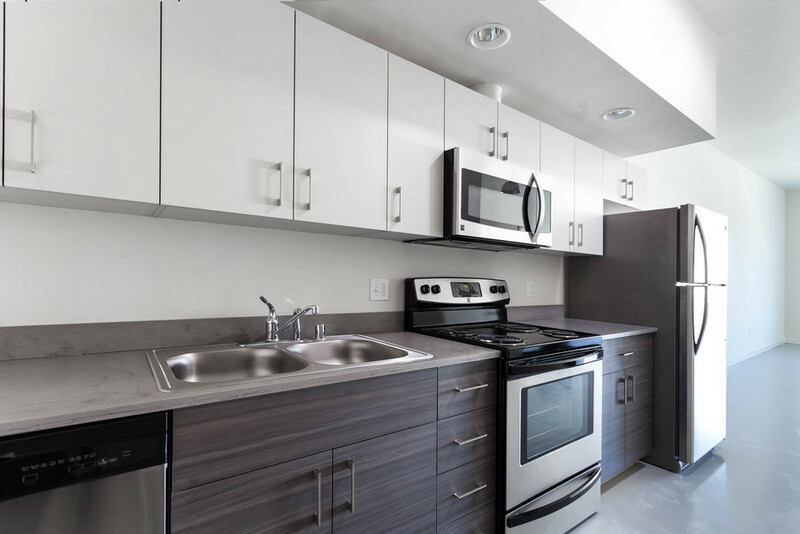 Our approach was to select cabinetry finishes, paint and lighting that spoke to each building type while allowing stylistic breathing room for imaginative tenants. 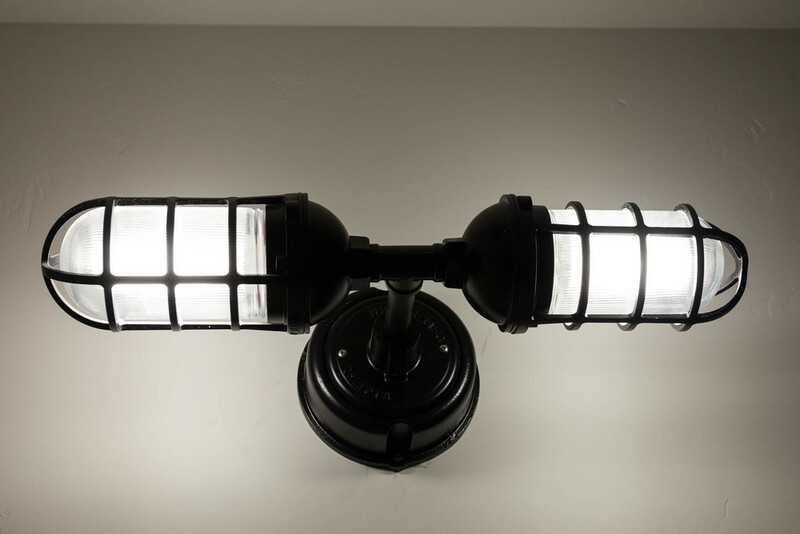 All fixtures are industrial, but with subtle form and finish variations corresponding to its respective historic or new setting. Tasked with conceptualizing a feature for the voluminous community room, we proposed a custom ballast rock-inspired light installation, using Tyvek house wrap, that was later detailed out and fabricated by a local lighting designer. Sacramento-based architect and developer Ron Vrilakas reached out for interior consulting on this ambitious new urban infill project located in the established community of Oak Park. Phase I included the construction of 3 new town homes for sale as well as 4 new lofts for lease. Our team was responsible for selecting all finishes used throughout including flooring, interior and exterior paint, tile, art curation and custom millwork. Notable design details include a locally-made walnut waterfall edge counter and custom hot-rolled steel open shelving in the loft kitchens. What happens when you take a popular yet casual, locally-owned cafe concept and move it to a high-end suburban shopping center? 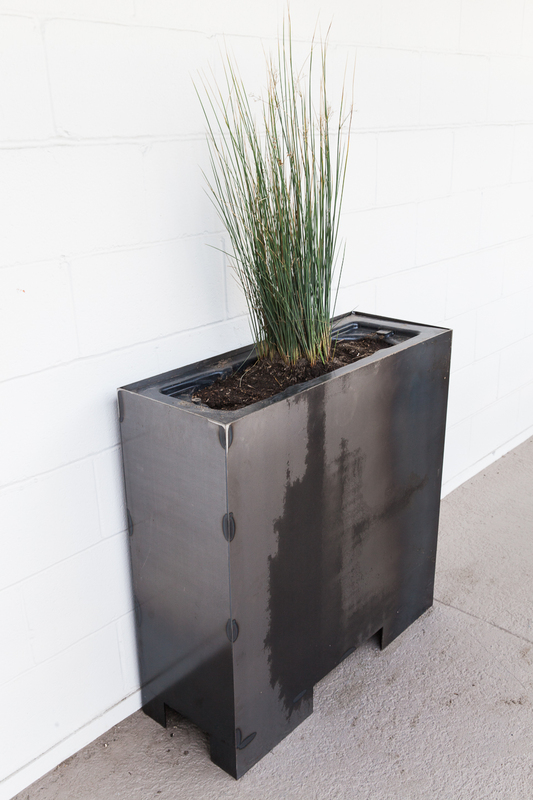 That was the design challenge we eagerly accepted in the late summer of 2013. After successfully designing (and naming!) a completely rebranded restaurant near the California State Capitol with a notable Sacramento restaurant group, we began researching new layouts, materials, lighting and display for a new Cafe Bernardo set to take over a former boutique market and wine shop. The result is a bright, uplifting interior which includes a custom communal dining counter with integrated lighting and bespoke stained glass factory windows, surrounded by dramatic, random-width white wainscoting. 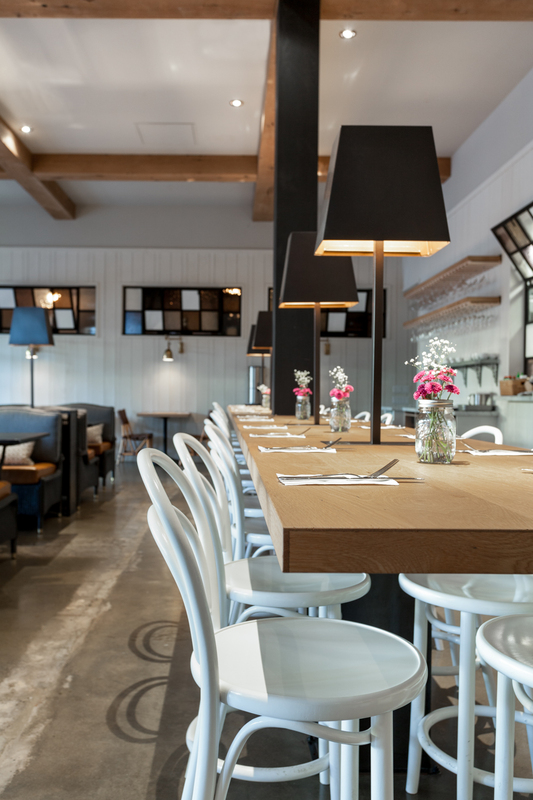 Polished concrete floors, honed marble counters, white oak table tops and beams, and brass lighting contribute to this warm and engaging palette, simultaneously elevating and softening the european cafe experience. 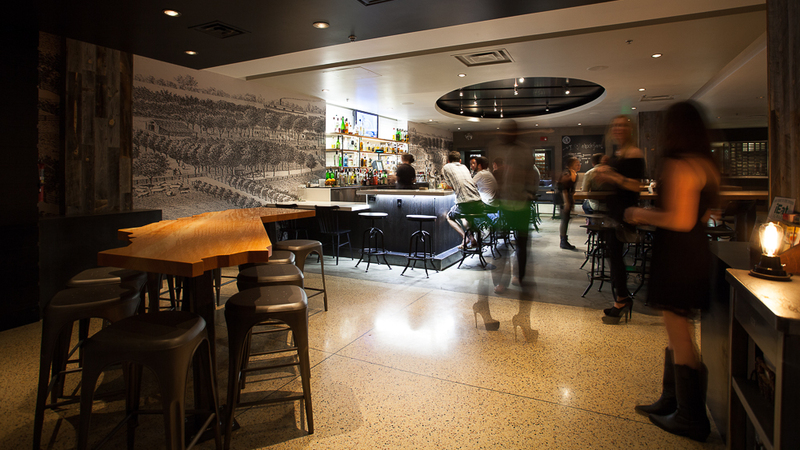 When our clients decided the bar adjacent to Cafe Bernardo should celebrate David Berkley Fine Wines, a shop formerly housed in the same space, we set to work researching appropriate products and concepts to pay proper homage. Taking into account Sacramento's adjacency to Amador Wine Country, we specially chose to honor this unique and unspoiled grape growing region by employing sophisticated and understated design moves throughout. 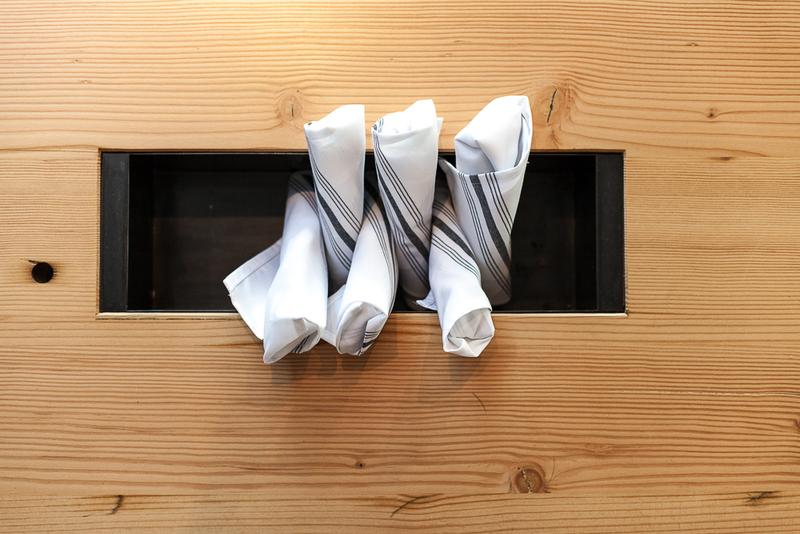 Also taken into account was the unique condition of having an open connection between the restaurant and bar sides. The separate interior concepts had to be distinctive yet agreeable. 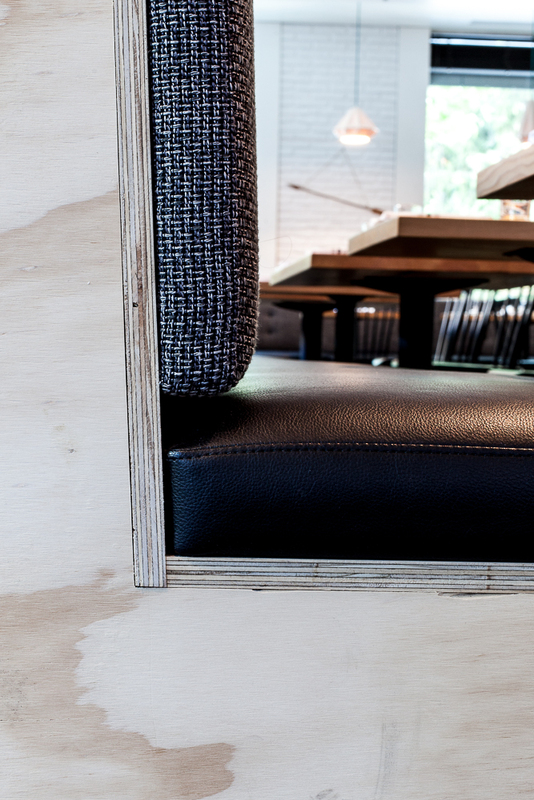 Authentic wine-inspired features in the bar include bespoke wallcovering with imagery from the Shenandoah Valley vineyard, reclaimed barrel oak wall cladding and a hanging quarter wine barrel installation at the main entry. 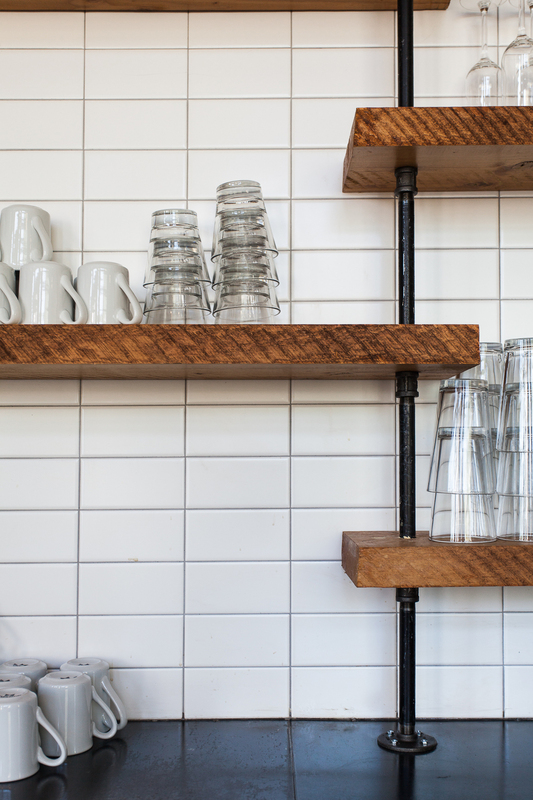 Materials with a more interpretive, aged quality like tin ceiling tiles, patinaed steel shelving and light fixtures and the ornate ceramic tile at the bar front serve to round out the concept. 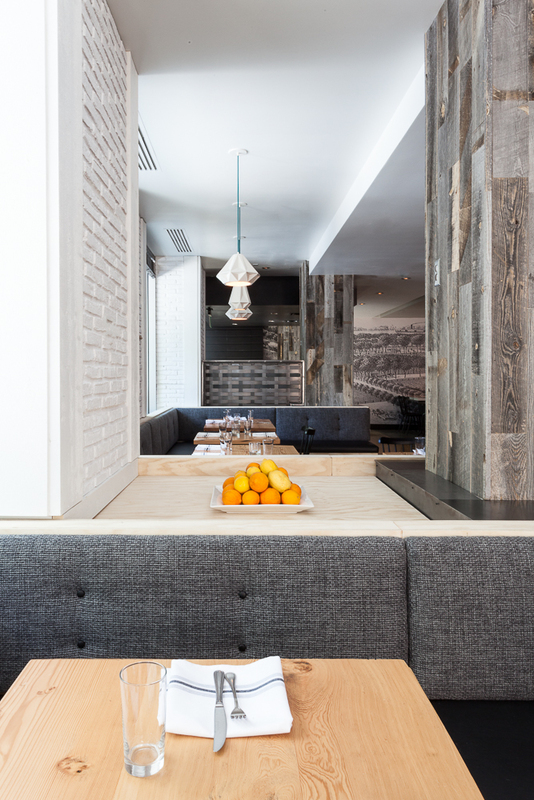 The reclaimed oak bar top gives patrons a visually soft, tangibly warm feeling while the blackened oak column cladding, brass lighting and paint help tie the bar interior back into the adjoining restaurant aesthetic. 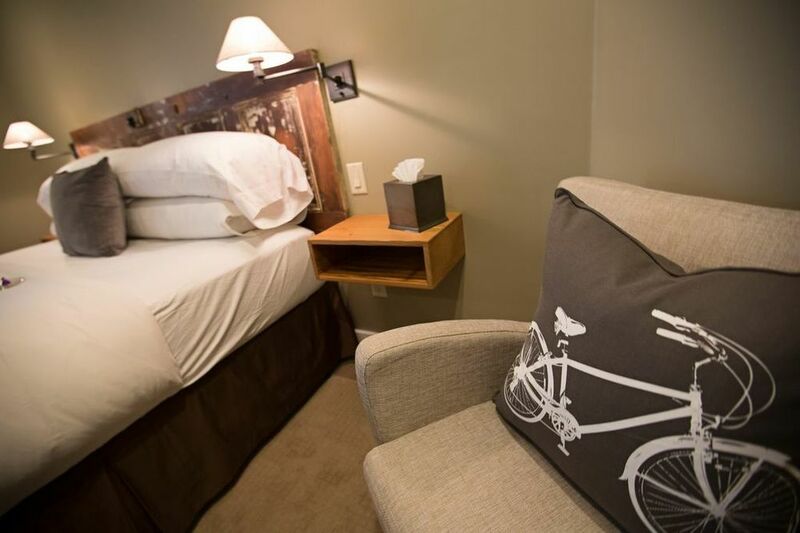 During an extensive 2013 remodel of the luxury 16-room Hanford House Inn, the young owners decided to reimagine their already successful gourmet B&B model to include a full-service restaurant. Renovations to the existing historic structure incorporated the addition of a light and open dining room, bar, private event room, commercial kitchen and outdoor dining patio. The design plan called for reuse of existing historical building elements like doors and windows while infusing new, more contemporary materials, furniture and lighting. 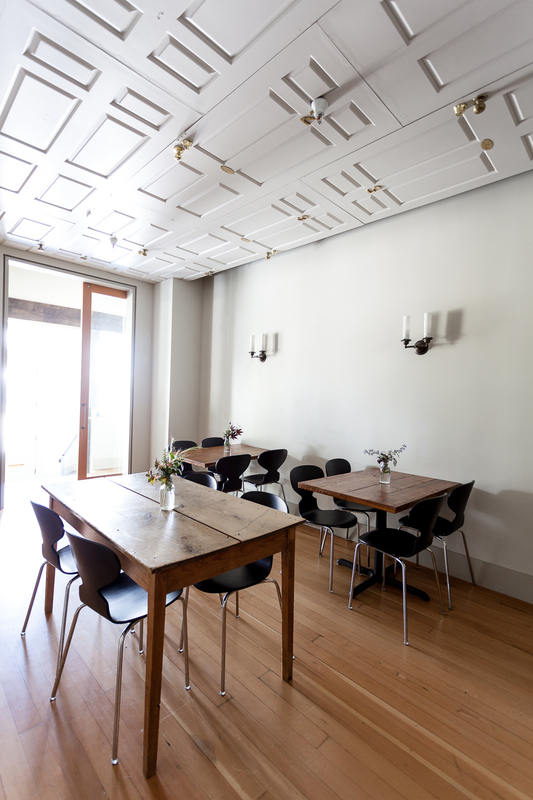 Salvaged wood was repurposed as wainscoting in the main dining area and reclaimed guest room doors can now be found installed as cladding on the ceiling of the conference room, hardware and all. 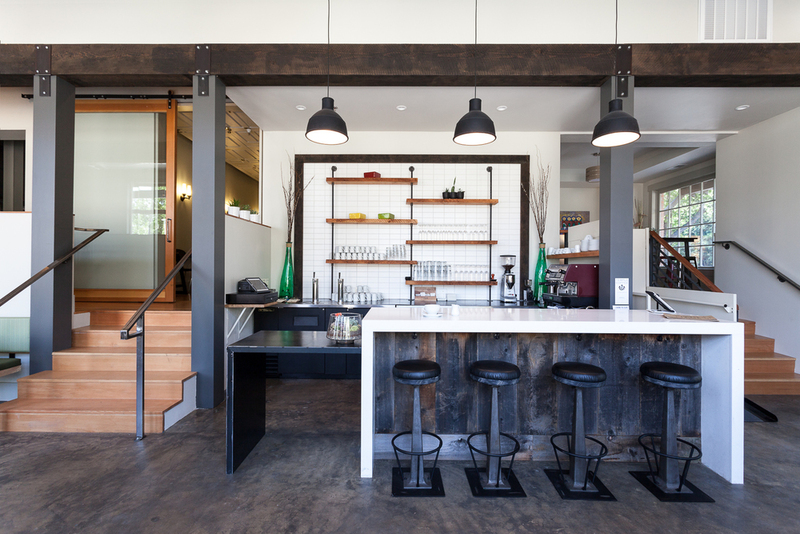 Situated in the bustling tourist town of Sutter Creek, Element now offers a unique experience for those craving thoughtful food and a casual, wine-country atmosphere. Perfectly nestled in Sierra Nevada foothill wine country, Hanford House Inn was known for it's charm but in need of renovation. With the architectural plans already finalized, our team was engaged to consult on interior furniture, finishes and lighting, including the integration of reclaimed materials salvaged by the owners during demolition. The result is a clean yet warm palette of doug fir and steel running throughout the common areas and private guest rooms. The custom lobby desk is constructed using a repurposed vintage industrial cart and was a collaboration between our designers and a local furniture maker. A utilitarian two-way security mirror behind the lobby desk is cleverly disguised by, and integrated into, a gallery installation. 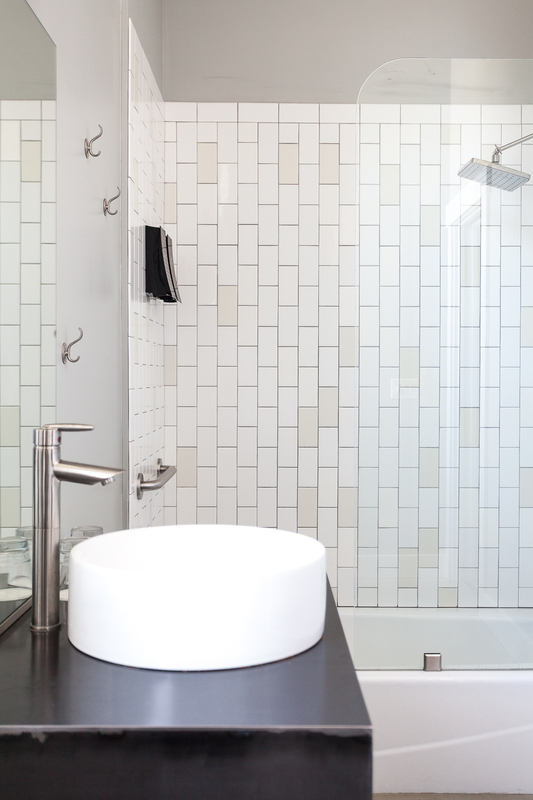 Clean lines can be seen in the design of the night stands and bathroom vanities while the shower wall tile layout is a variegated blend of vertical white subway tile to add interest. 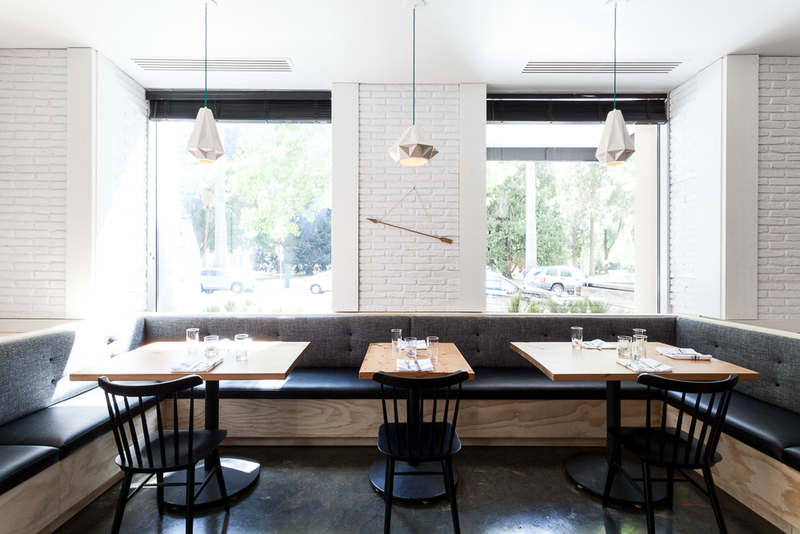 In late 2012, we were hired by prolific Sacramento restauranteurs to reimagine a once popular, but rapidly waning, restaurant into something more hip, meaningful and relevant. With the 'farm-to-fork' movement being our primary guide, and with a keen interest in imparting a fresh perspective into the local restaurant scene, we took our research to the archives of local historical libraries for direction. 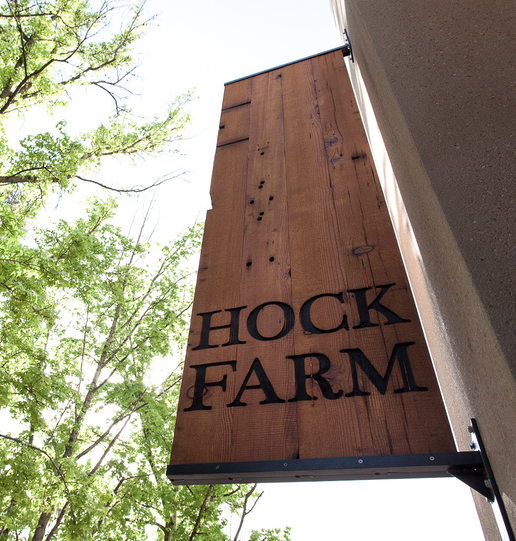 Early discoveries inspired us to pitch the name 'Hock Farm' after learning the story behind John Sutter's retreat, also the first large-scale agricultural settlement in Northern California. Of greater interest was creating a design that could facilitate dialog surrounding lesser known details of the region's history. By incorporating elements informed by the Nisenan Native American people, who inhabited a nearby village the farm was named for, the design simultaneously celebrates and brings to light our varied past while prompting deeper inquiry and discussion. 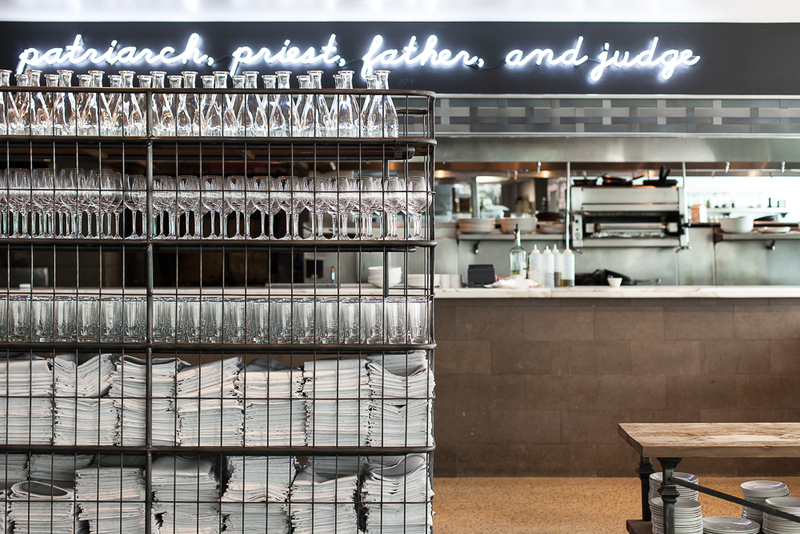 Interpretive design elements in the restaurant and adjoining bar include steel partitions inspired by basket weaving, an enlarged historical drawing of Hock Farm, and a bold yet ambiguous neon sign over the open kitchen pulled from a John Sutter quote. 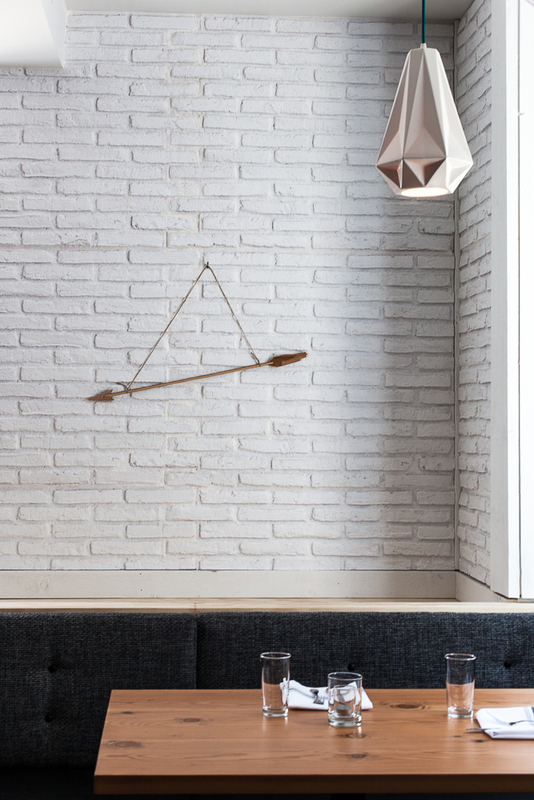 These engaging features are balanced over more refined and current pieces like white subway tile, birch plywood banquette seating and luminous porcelain pendants. 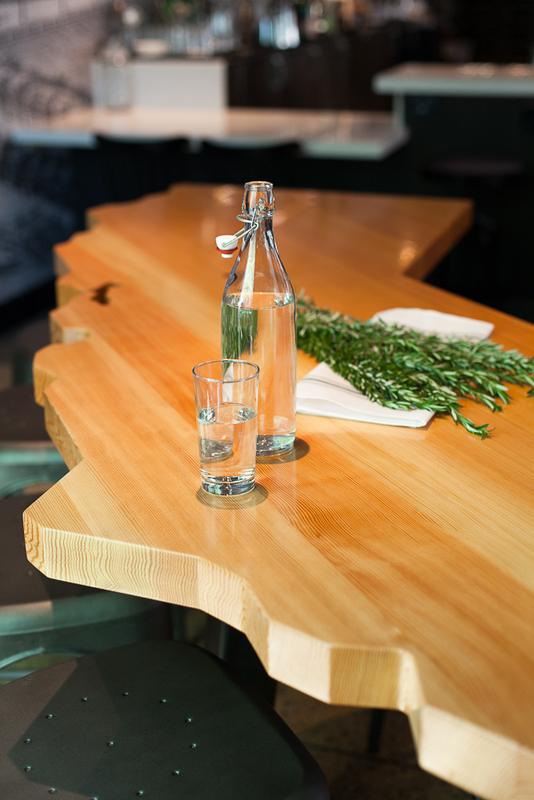 Custom and locally-sourced furniture and fabricators were carefully selected to assure conceptual congruence and encompass an 8' community table in the shape of California and an oversized linear blade sign made from reclaimed doug fir. 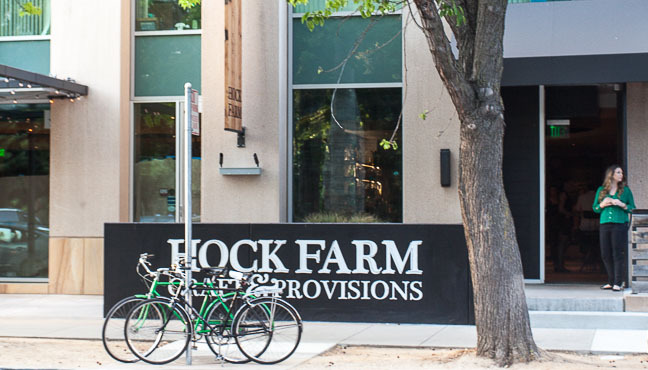 No detail was overlooked in our comprehensive approach to designing Hock Farm.